The Rebel Sweetheart. : Positive Ways Failure Can Shape Your Future. From childhood, most people develop a fear of failing. You've learned to work hard and try to make good choices but unfortunately, even the greats face failure sometimes. The difference between being knocked down and staying there is how you go about getting back up. It's the hard work that gets us where we need to be, but working smarter is what will get you where you want to go in life. When failure hurts the worst, it's often in an area where we've worked hard and put in a lot of effort. Failing after trying so hard hurts, but it's in that disappointment we can often learn something. Combining the lessons learned with a determined work ethic can help you come out a winner next time. When studying to earn a degree, you may work hard on assignments, but your lifestyle might not fit with the environment. If you already have a demanding job, obtaining higher education through an on-campus degree can result in failure. Instead, work on your online masters in criminal justice and look toward a brighter future. Image via Flickr by Quotes Everlasting. 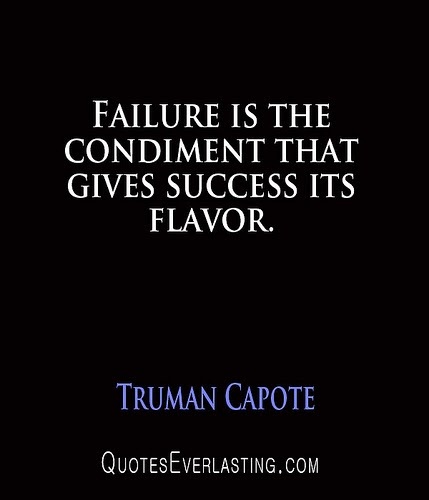 Failure can be defined by many things. For many people, though, facing our fears and seeing them become reality can help us move on. Losing a dream job may feel like the worst thing imaginable. Life feels like it's over, and in a sense, a chapter has indeed closed on a former life. It's often in facing a fear, however, that you find the freedom you need to succeed. Stop Taking Failure So Seriously. When you fail, you face a lot of embarrassment. The best way to cope with this is to get in on the humor of the situation. Failure can be a helpful way for you to learn to laugh at yourself a bit more. When you're not taking every situation so seriously, you'll be less stressed out, and this can lead to more confidence so you might actually do a better job. Suddenly it doesn't matter so much if everything is perfect, as long as you're getting the most of the experience and doing your best. When you've failed in the past, have you ever considered that the opportunity wasn't right for you? Perhaps you didn't get that big promotion you'd been hoping for, and it seemed like you failed in your career. While it may feel that way at first, perhaps there is a better opportunity that awaits. If you'd settled into the one that didn't work out, you may have never found a better one. Failure can force you to search for better opportunities. It can shape your attitude in a positive way and even grant you the ability to conquer a fear. By embracing this part of life, you can be a better success than you'd ever imagined. Perhaps it's not the moments in life that you get right that will lead to your success, but the ones you get wrong in the right way.